Footwear by Footskins’ American made knee high boots are handcrafted, calf-high moccasin boots made from over twelve square feet of luxurious, soft and supple Deerskin Leather. Deerskin is perfect for creating handmade men’s and women’s Knee High Boots because the buttery soft leather molds and contours to your foot with incredible ease, yet it is ranked third among the strongest leathers available. Deerskin moccasin knee high boots have a durability matched only by their outstanding comfort. Deerskin moccasin knee high boots can also be made-to-measure. Inquire about Custom Made Knee High Boots or our Deerskin Moccasin Boots. Also, ask us about cowhide knee high moccasin boots made from specially tanned and tumbled genuine Texas steer hide! Choose brown or saddle colored men’s knee high boots with a plain fringeless top in cowhide or with a four inch fringe around the moccasin boot top in deerskin. 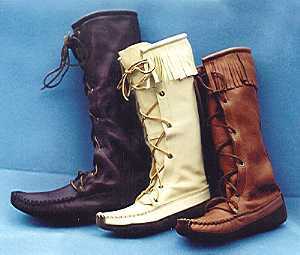 Deerskin knee high moccasin boots are also available for women with fringe in creme or saddle color. 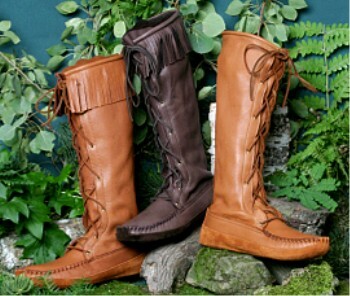 Women's cowhide knee high moccasin boots are available in brown or saddle color. All ladies knee high moccasin boots also feature a gusseted tongue and a fully laced front. We can custom make women’s knee high boots for thin legs, for larger calves or for wider feet. Our workmanship is 100% guaranteed. Order Men’s or Women’s Knee High Moccasin Boots Now! For more information about men’s knee high boots, women’s knee high boots or made-to-order custom knee high boots and moccasin shoes handmade from genuine deerskin leather or cowhide, please Contact Your Handmade Moccasins Representative or call us at 507-498-3707 weekdays, 8:00 – 5:00, CST. "I placed an order with you for a pair of men's knee-high boots without fringe in the cream color. My husband received them last night and he is thrilled with the quality and fit. in a color not usually made in that size! Thanks for your great service. "I placed an order with you for a pair of men's knee-high boots without fringe in the cream color. My husband received them last night and he is thrilled with the quality and fit. I just wanted to write to say thank you for being willing to provide the boots so quickly in a color not usually made in that size! Thanks for your great service. We'll definitely spread the word about your company! :)" See more testimonials. Purchase your knee high boots now!